Blue Emu and Australian Dream – Which is Better? Blue Emu & Australian Dream – Which is Better? According to statistics, joint pain is becoming one of the most common complaints of people seeking medical attention. Damaged joint tissues commonly cause joint pain and other symptoms of stiffness and inflammation.This happens due to aging, frictional damage, stress, and trauma. While there are joint supplements that you can take to aid in the repair process of the joints, the effects are not immediate. Topical analgesics provide a quick and effective relief from joint pain, and can help you get through your daily activities. Blue-Emu® is a unique topical analgesic due to the combination of its ingredients that provide quick and long long-lasting pain relief. Blue-Emu® joint products are topical analgesics that come in cream and spray preparations. The product contains Emu oil that is a natural omega rich fatty acid. Emu oil is a by-product when the birds are processed for their lean meat. Omega rich oils have many benefits especially when combined with other ingredients to be applied topically. It ensures an efficient delivery system for the product thus ensuring optimum benefits. Blue-Emu® combines Emu oil with ingredients like Aloe Vera, methylsulfonylmethane, and glucosamine to provide quick and effective relief from joint pains. Not only does it reduce joint pain but it also supports optimum joint health. Blue-Emu® Original – Stabilized Aloe Vera Gel, Emu Oil, Cetyl Alcohol, Stearic Acid, Dimethicone, Glycerin, Methylsulfonylmethane (MSM), Oleyl Alcohol (and) Zanthoxylum Alatum Extract, Horse Chestnut Extract, Comfrey Extract, Calendula Extract, Chamomile Extract, Vitamin A, Vitamin D3, Vitamin E, Glucosamine Sulfate Sodium, Allantoin, Panthenol, Ethoxydiglycol, Carbomer, Diazolidinyl Urea, Methylparaben, Tetrasodium EDTA, Propylparaben, Triethanolamine. Blue-Emu® Continuous Pain Relief Spray – Trolamine Salicylate, Aloe Barbadensis Leaf Juice, Caprylyl Glycol, Diazolidinyl Urea, Dimethyl Sulfone, Dosodium EDTA, DMD Hydantoin, Emu Oil, Glucosamine Sulfate, Glycerin, Glyceryl Caprylate, Lecithin, Oleic Acid, Penthenol, Phenoxyethanol, Polysorbate 20, Sorbitol, Water, Xanthan Gum. Blue-Emu® works primarily by supplying key building blocks for joint health such as glucosamine and MSM directly into the affected area. As we all know, glucosamine is essential in the repair process of damaged tissue and cartilage joints. It also has anti-inflammatory properties thus when applied topically, it can effectively reduce joint inflammation and the pain accompanying it. MSM on the other hand has the analgesic property that has long been used for treating joint pains. Thus when these ingredients are combined with Emu oil, the efficient delivery system is ensured to the area where Blue-Emu® is applied. It relieves joint pain, inflammation, and swelling. It also helps reduce muscle ache and soreness. It provides quick and long lasting pain relief. It does not have strong scent. There are concerns that Emu oil can cause bacterial infection especially when applied topically however this only happens if the Emu oil used is not purified and manufactured properly. The Emu oil contained in this product is premium, purified, and tested to be safe for use. To ensure safety, Blue-Emu® should be used as directed on the packaging. Apply Blue-Emu® liberally on the affected area and massage thoroughly to ensure even distribution and absorption. For the first 2 weeks, Blue-Emu® can be applied 2-3 times daily. After the first 2 weeks, application can be reduced to as needed basis. The product is to be applied only externally. Do not apply the product on broken, irritated, or broken skin. Avoid using the product if you have known allergy to shellfish because the glucosamine of Blue-Emu® is sourced from shellfish. Wash hands immediately after using Blue-Emu® to avoid transferring the product to eyes and other mucus membranes of the body. If accidentally swallowed, seek immediate medical attention or contact the poison center. Do not use heating pads over the area where Blue-Emu® is applied. Avoid using Blue-Emu® along with other topical products unless otherwise specified by your physician. Blue-Emu® is a revolutionary joint product since it contains key building blocks for joint repair like glucosamine and MSM which is coupled with other ingredients that aids in relieving joint pain. Unlike other topical products for joint pain that only causes numbing effect on the affected area, Blue-Emu® targets the problem right at the very source that is the damaged joint and cartilage tissues. This product not only relieves joint pain, inflammation, and stiffness, but it also supports optimum joint health. Australian Dream – Does it Work? 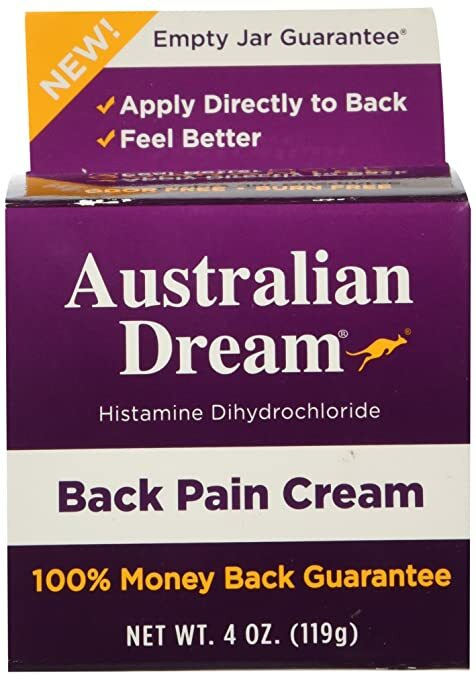 The product Australian Dream Cream is a brand of topical pain reliever that helps treat a number of different conditions. While its main purpose appears to be the treatment of pain from Arthritis, the cream also can help ease backache, sprains, muscle strains and bruising. It is sold from many retail stores worldwide and has a very simple but informative product website. The Australian Dream Cream manufacturer is well established and all contact details for them are provided on the site, including information about their history. The site does not sell the product directly to consumers but does provide a link to help consumers locate a store that carries the brand. Australian Dream Cream is available in three different sizes (2oz, 4oz and 9oz) and the cost varies depending on size and retailer. All purchases have a 100% ‘empty jar’ guarantee offered by the manufacturer. While the product website itself does not contain any consumer testimonials or reviews, Australian Dream Cream is endorsed by the well-known game show producer Chuck Woolery who appears on the site as a spokesman for the brand. For customer reviews, I checked out Amazon, where there are over 450 (mostly positive) reviews. Australian Dream Cream is specifically designed to enhance the body’s own response to pain by increasing the flow of blood to the affected area. It does so using a natural blend of ingredients that work fast and effectively but without the burning sensation often caused by other topical pain relievers. It is applied directly to the painful area so it can start working upon contact. It can be used 3-4 times a day, with just a small amount required per use. There are no specific details provided on the product website as to how soon results can be expected or if it needs continuous use in order to maintain results, although this is likely dependent on the nature and severity of the pain. There are several ingredients of note used in the Australian Dream Cream formula, although the substance mainly responsible for increasing blood flow is Histamine Dihydrochloride. A natural vasodilator, this ingredient allows a greater volume of blood reach the painful area, helping the body heal itself more effectively. Histamine Dihydrochloride is combined with the well-known pain relieving ingredients Chondroitin and Glucosamine which are often used together for their superior joint pain benefits. It is not clear how effective they are when used topically however, as they are usually found in oral capsules. Unlike creams that contain Capsaicin, Australian Dream Cream does not sting or burn the skin making it ideal for all skin types. While it uses certain emollients for ease of application, the cream is non greasy and, because it uses no menthol or camphor, will not leave a strong odor. 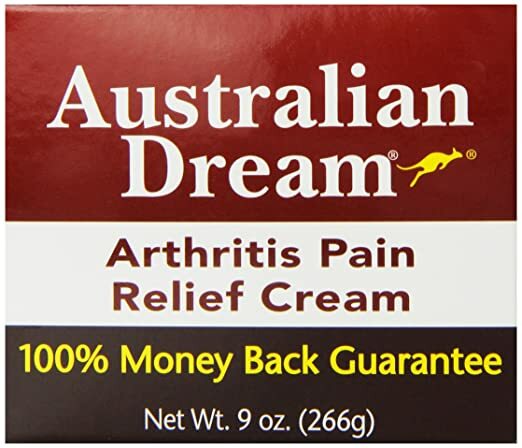 Australian Dream Cream uses several natural ingredients that will certainly help relieve pain associated with arthritis and other joint and muscular conditions. Overall, Australian Dream Cream is a reputable, good quality brand that, despite being one of the more expensive brands on the market, can be relied upon for fast, non-burning pain relief. Read customer reviews. Blue Goo is another emu oil product which provides professional strength joint pain and other types of pain relief. This brand comes in both gel and cream form. Temporary relief for muscle aches, pains and strains, arthritic pain, joint pain, and tendonitis. Fast-acting solution to relieve you from discomfort. The brand is made from 100 percent pure emu oil, just like Blue Emu, hence, you’re getting a potent yet safe ingredient. Blue Goo joint pain cream or gel is made by Garcoa Laboratories. This US-based The company also has foot care products available. Garcoa Laboratories is the go-to manufacturer of athletes, health buffs, and sports professionals alike. The company goes by the saying, “reliable relief you can trust”. They make their products only from the finest and safest ingredients. Blue Goo uses MSM, Glucosamine HCL, Chondroitin Sulfate, Emu Oil, Menthol, and White Willow Bark. It’s also made with other herbs that have been carefully measured and blended synergistically to relieve your body from those pesky aches and pains immediately. As mentioned, Blue Goo contains emu oil. Emu oil is easy for your body to absorb. It’s high in oleic acid. This acid increases the cream’s ability to carry compounds into the skin cells. It doesn’t contain phospholipids, which delays absorption. 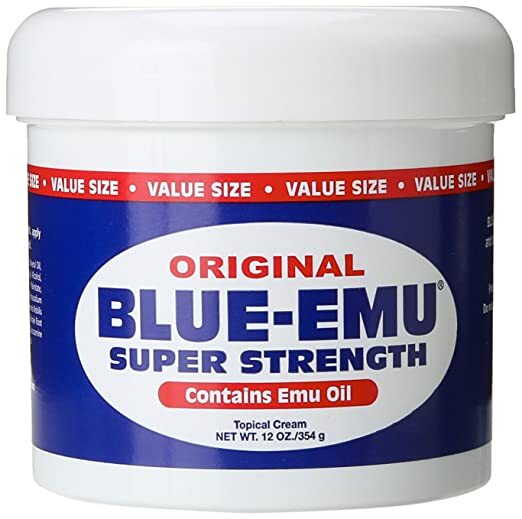 My thoughts are that if you want to try a product with emu oil, Blue Goo would be a good, less expensive substitute for Blue Emu. There are some terrific customer reviews of Blue Goo at Amazon. Topricin has been around since 1994, and provides safe, homeopathic pain relief. The cream is a combination of natural biomedicines that stimulate your body’s natural healing system. It is odorless and greaseless. Active homeopathic ingredients in Topricin include: Aesculus Hippocastanum, Arnica Montana, Belladonna, Crotalus Horridus, Echinacea, Graphites, Heloderma, Lachesis mutus, Naja tripudians, Rhus toxicodendron, and Ruta graveolens. I’ll admit that I am skeptical of homeopathy, but I could not ignore the customer reviews. With a customer rating of 4.6 out of 5 from over 2,000 customer reviews, there must be something in this that works. Because of all the great customer reviews (and even though I am skeptical of homeopathy), I think Topricin is worth a try. Remember that even the best topical pain relief products only provide temporary relief. In order to be proactive for more severe, chronic joint pain, the consumer may need to also use an oral supplement which can actually help repair and rebuild damaged cartilage. 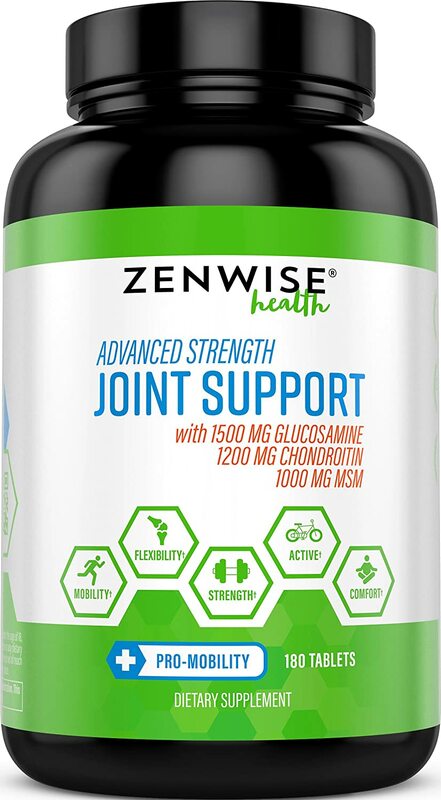 ZENWISE Health Joint Support is a full spectrum solution that provides the body the necessary building blocks to repair damaged joint tissue, improve synovial fluids and neutralize the root causes of joint issues. I like that this product not only contains therapeutic dosages of glucosamine and chondroitin sulfate, but also hyaluronic acid, MSM, and curcumin. Advanced Strength Joint Support has over 2,200 consumer reviews, and has a terrific ratings as an Amazon bestseller. I hope this article provided you some practical information on topical pain relief products. I have used Topricin for various injuries the last 5 years. I tore the miniscus in my left leg when slipped. My Dr recommended surgery but that I could try just physical therapy if I wanted. I read the data on both and seemed took about as long to get full recovery so opted for therapy. After only 3 sessions I felt more pain and even felt the therapist hurt me creating added injury. Common sense made me conclude healing time with very judicious movement to maintain range of motion was called for but searched online and chose Topricin as a boost to self healing. Took a few more months than after surgery statistics but I have fully recovered and pain free in that leg with full movement and full weight baring with no problems. AND very little pain with no pain medications. I also used on a sprained thumb and though still some pain lifting things from overhead feel healing now at 90%. I recommend to everyone I know that suffer joint or muscle pain. Thanks for sharing your experience, Ann!